Thanks man for all the helpful comments. Using paraview… can I say that based on this visualization, there is no BL generated for this (y+=1)? regenerated y+=1 as I found out I forgot to uncheck the “relative mesh size” in the main mesh settings… unable to visualize in SimScale Mesh Clip and yet to download to paraview. Will have to wait till tomorrow but I am not overly optimistic about it. I specified 13 layers to be added but as you see, only about 3 layers max was generated. Is it possible to say what were the issues? Like, can it be said the surrounding volume mesh is not fine enough compared to the layer thickness? Or is it likely just an issue of mesh quality, eg. aspect ratio of the cells becoming too large? I am trying out larger number of “cells between levels” in the Castellated Mesh settings. Deletion of layers is due to the quality controls of the mesher. Earlier in this thread I believe I posted the link about layering in SimScale and one of the troubleshooting steps to prevent layer deletion was to decrease the quality control. I’m sure you have done that before as well, is that setting still maintained? Yes this is also a possible issue. If what I mentioned earlier does not allow you to generate the % of layers needed, then do add a region refinement around that area. That should help in layer generation, but by how much is unknown. Refer back to my first comment. Yes this is usually the case for layer deletion. This should not help that much. As mentioned it is the quality controls likely deleting off your layers. Thanks @Get_Barried. Yeah I did read that before and for good measure, I just re-read that. I altered the aspect ratio allowed and also the min determinant factor. Got the layers! Now, just wanna tailor it some more… hope it works. And then to run the first simulation… and hope that the results are good too - gonna compare it to my blade-element momentum results. Looks good. Do you know what your % of layers inflated is? (you can check the meshing log). I am a little at the cusp of whether this will work out. Could you share your experience with other meshers (free or commercial)? 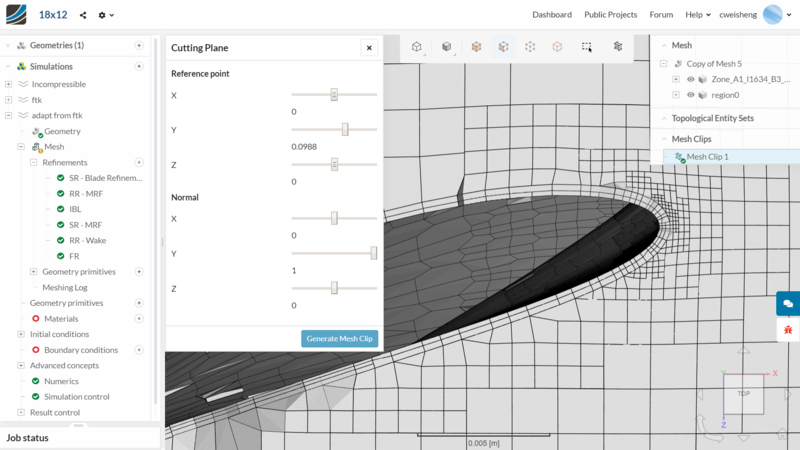 I worked with one for the most part of a decade in my previous job and never had so much problems with mesh generation - I was more of a user than a developer- I guess I was pretty sheltered from the true CFD issues. Currently, I am moving into a project and might actually propose for the Client to shell out the money so that we can move forward faster. Yes that is the problem with the current mesher (snappyhexmesh). Powerful but hard to tune to get exactly what you need. Again quality and snapping issues are causing the layers to not be generated. I suggest trying out cfMesh. It is an automatic mesher, but you will need to figure out how to get it setup. I do not think it requires OpenFOAM to be installed however the GUI version of it will cost money. The free version is as good but without the GUI so you’ll have to mesh via a terminal and check it either using ParaView or something else. The more conventional meshers are the ones in the Ansys package. ICEM is one of them. Of course these are all paid and you will need to re-learn a couple of things so not sure if its a path you want to take. 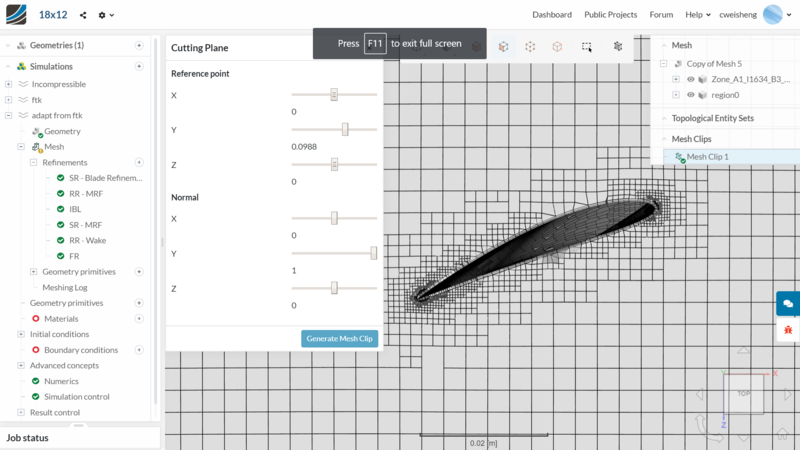 I worked with one for the most part of a decade in my previous job and never had so much problems with mesh generation - I was more of a user than a developer- I guess I was pretty sheltered from the true CFD issues. Don’t really need to be a developer to know about the meshing behavior . But it helps. In this case its just the mesher being very difficult to tune. Do try out the other meshers as mentioned. You probably will have better results there. I followed pretty much what I can see from FiliptheKing’s. Now, for the pressure setting in the initial conditions, it is a gauge pressure, which I understand to mean it references another setting. This setting, I thought to be “Pressure reference value” under Numerics. However, I saw this to be set to 0 Pa for FiliptheKing’s. Should this be the flight altitude pressure? And then the initial condition (gauge) pressure value will be 0 Pa.
For pressure outlet, I set it as 0 Pa. Does these sound about right? Most wanted to clarify #3. Which simulation are you referring to? Yes, all 0 is fine. There is no need to indicate this for a simple incompressible simulation. P.S Realized you’re from Singapore, I am too so hello! @Get_Barried, good to link up since we are countrymen! That’s rare too! I might have made some headway though still not 100% applicable. I decided to use a high density STL to try (previously was using IGES). The problem with using STL is that I was only able to generate the propeller geometry and not the surrounding volume for MRF. Haven’t got around to trying… does anyone know if I can use a geometry primitive for the surrounding volume for MRF, AND one for the outer farfield boundaries? Looks pretty good. I’ve been exploring cfMesh and attempting to mesh the other topic where Dale and others were discussing. That geometry is giving me issues so I think I will move on yours and attempt to run it through cfMesh to see if I can get a better quality. I don’t believe you can use the geometry primitive. Not exactly sure though. I’ve always generated my MRF volume through CAD. As for the outer farfield boundaries, that should be possible as it is effectively just the bounding box. Alright, so the mesh from the STL really does look good after I did a couple more cross-sections. However, this is infuriating as I am trying to do a MRF and so I need another volume around it for the MRF. After experimentation, I do need this volume to be imported together in the CAD, which unfortunately 2 solids, with 1 inside the other, is not compatible with STL! ARGH. @jousefm or anyone at SimScale able to help here???! I did another based on STEP geometry, it was good too but not as good as the STL one. i.e. the prism layers did not form as comprehensively as the STL one. for imported CAD geometry format. Will post some pictures tomorrow. 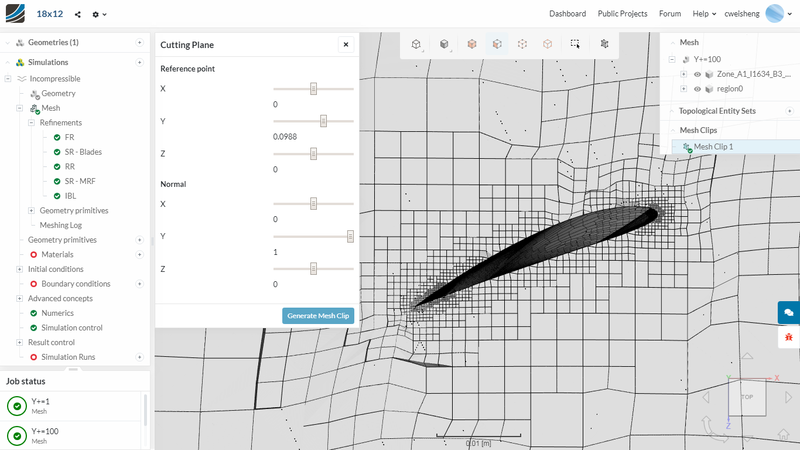 @cweisheng: I use near exclusively STL for my geometries, 80% of them have defined MRF volume, rotor, propeller or whatever being inside and never had problem with it. Why it would be incompatible, please? Great to find a relevant expert! I guess I would like to ask which CAD software you are using, and how do you export both geometries, the rotor and the MRF volume as one STL (or not, and if not, how do you import and work into SimScale)? Would it be possible to share your workflow in some detail? I am sure it is just my ignorance. I would be interested to know the workflow for generating a MRF volume in STL as well. Snappy and cfMesh both prefer the STL format (though cfMesh does like another format called fms) so knowing how to generate it would be great. Geometry contains ‘solid_0’ composed with ‘ascii’ and ‘ascii_1’ bodies. MRF zone definition is as near as possible to rotating body. I did filetted the edges to avoid high gradients with air moving (shear) in standing still air (whole BMB). Now, I did it in Fusion, with ‘export’ to STL. This is old Fusion and I cannot tweak the resolution of STL mesh there. 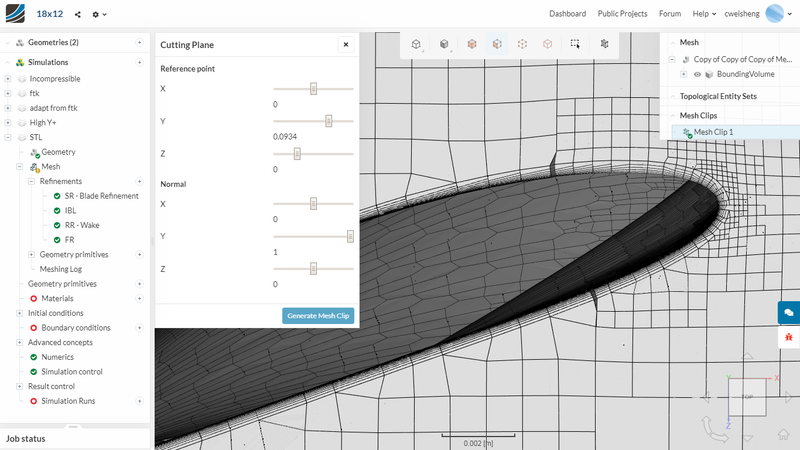 @cweisheng you can export / import that geometry to you CAD tool and see how your CAD will handle those bodys. Switch the visibility of one or another, you should be able to handle it without problem. I said I used Fusion, but I prepare to use OnShape. My first test with STL shows, that OnShape merges parts. Above, second element ‘Facet normal’ belongs to another part. First part stops with first ‘Facet normal’ element. There is no name attribute to separate both parts. So possibly no way to discover different parts while parsing that text file. Too bad. You can export those parts in separate files: final format is in ZIP. Than I would need to write a script to merge those parts in one STL file, with elements attributes indicating different names. Above I replaced ‘ascii’ with ‘Blurb’. Simscale will respect it. If all solids are named ‘ascii’, Simscale will increment the name with ‘_1, _2, …’. Ok, I just need to find out how to do that as I am not familiar with the process you mentioned. But thanks! I imported them into SimScale - it was one solid but 2 i-dont-know-what (faces?) 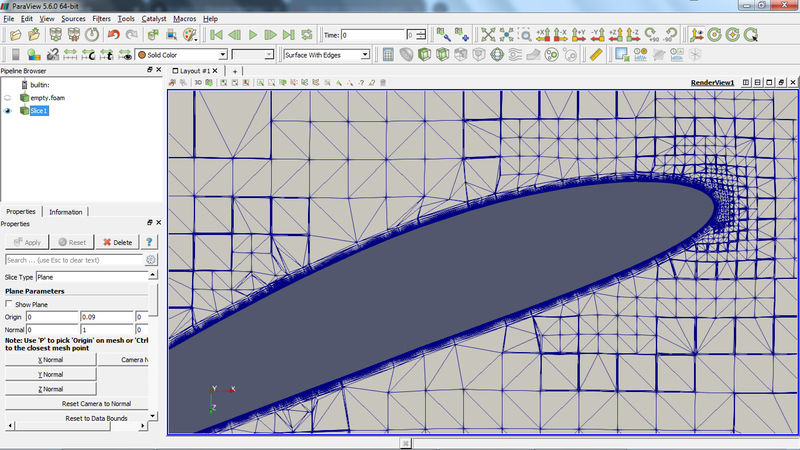 that i was able to select for meshing based on mrf and propeller. 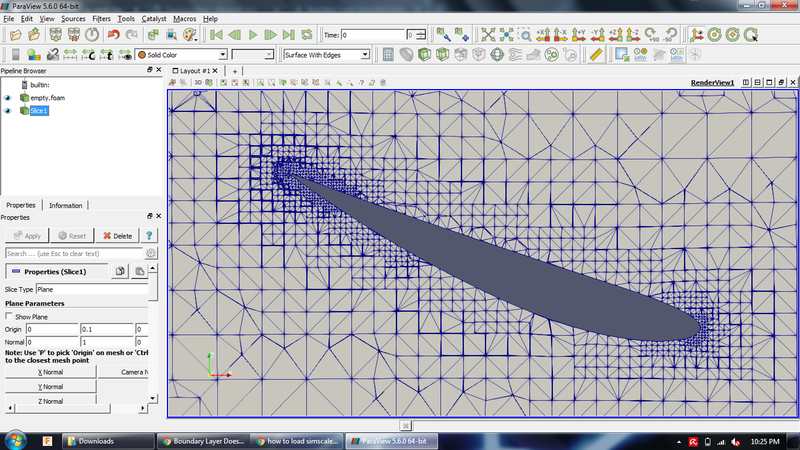 it’s meshing now… so fingers crossed. still, great hack! will update if it works.